If you are a smoker and you are pregnant, your baby has something to tell you — quit smoking now! Cigarette smoking during pregnancy can cause serious health problems to an unborn child. Smoking during pregnancy has been linked to premature labor, breathing problems, and fatal illness among infants. An estimated 430,700 Americans die each year from diseases caused by smoking. Smoking is responsible for an estimated one in five U.S. deaths and costs the U.S. at least $97.2 billion each year in health care costs and lost productivity. Similar to the use of psychiatric medicines during pregnancy, smoking during pregnancy is estimated to account for 20 to 30 percent of low-birth weight babies, up to 14 percent of preterm deliveries, and some 10 percent of all infant deaths. Maternal smoking during and after pregnancy has been linked to asthma among infants and young children. In 1996, 13.6 percent of mothers were reported to have smoked during pregnancy, and in 2005, 10.7 percent of all women smoked during pregnancy. This shift indicates that greater numbers of women are aware of the dangers and making positive changes. Nonetheless, one in ten unborn children remain at risk from their mother's smoking. Smokers inhale nicotine and carbon monoxide, which reach the baby through the placenta and prevent the fetus from getting the nutrients and oxygen needed to grow. Secondhand smoke also adds a risk to pregnancy, so if anyone in your home smokes, tell them to take it outside. You may think it is okay to smoke if you just cut back, but reducing the frequency of smoking may not benefit the baby. A pregnant woman who reduces her smoking pattern or switches to lower tar cigarettes may inhale more deeply or take more puffs to get the same amount of nicotine as before. You may breathe a sigh of relief after delivery and decide to light-up again, but think twice. Breast milk contains whatever is in the woman's body. If the woman smokes, the baby ingests the nicotine in her breast milk. 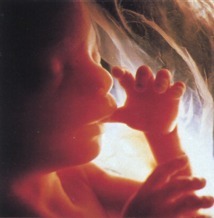 The most effective way to protect the fetus is to quit smoking completely. If a woman plans to conceive a child in the near future, quitting is essential. A woman who quits within the first three or four months of pregnancy can lower the chances of her baby being born premature or with health problems related to smoking. Pregnancy is a great time for a woman to quit. No matter how long she has been smoking, her body benefits from her quitting because it lessens her chances of developing future tobacco-related health problems, such as lung and heart disease, and cancer. Questions or concerns? Talk with other moms about your new pregnancy in our chatroom.